Maritime shipping emissions must be part of the global solution. This has been made clear in Paris with significant side events dedicated to shipping. Maritime shipping is the most used means of transport around the world. About 90% of all international exchanges go through maritime shipping. In 2014, about 10 billion tons of cargo were moved by sea. Yet the industry remains outdated and flat out dirty, in terms of its dependency on fossil fuels and greenhouse-gas (GHG) emissions. Shipping emissions are projected to increase significantly in the coming decades, between 50-250% to 2050, if business-as-usual does not change. (See the International Maritime Organization (IMO) “Third IMO GHG Gas Study 2014.”) Thus, the industry’s current worldwide contribution of GHG at about 2.2% will not stay this low for very long. Section 20 of the draft Paris agreement would give the IMO continued power to oversee GHG shipping emissions. The Kyoto Protocol also deferred to the IMO for shipping. However, the IMO has thus far failed to pursue significant climate change regulations for the shipping sector. Shipping needs to adopt smarter and greener ways to carry cargo across the world’s seas. It needs to transform from a fossil fuel sector to a wind energy sector. If a signed Paris Agreement gives the IMO responsibility of reducing GHGs in shipping, the IMO must make this happen. “It is not acceptable that a sector [maritime shipping] is increasing its emissions when all the world is fighting to reduce their emissions,” said Niclas Svenningsen, of the United Nations Framework Convention on Climate Change (UNFCCC), at a side event of COP21. The industry has been late in transforming itself – energy wise. It has been grasping at ‘low-hanging fruit’ to achieve small CO2 reductions. Liquefied natural gas (LNG) has distracted smart-thinking investors away from renewables. Reducing ship-speeds reduces emissions, but this does not result in fuel-use transformation. The shipping industry’s conservative scenarios hold the unfounded assumption that affordable, ample oil will be available for decades. But what is needed is strong leadership to steer strategic, long-term thinkers away from dirty fuels to clean technologies – especially wind. It is important to realize that investment projects that happen in the shipping sector today are going to stay with us for ten or twenty years to come. A ship being built today will likely be in operation for the next three decades. But how long can the status quo endure in a fast-changing world, that has seen 2015 as the hottest year in human memory? A levy on bunker fuels can help, but we need to demand the use of the seas’ clean, abundant resource – the wind. “Shipping needs to turn green,” said Sturla Henriksen, CEO of the Norwegian Shipowners’ Association. There is no other choice now but to embrace smart innovations and to reduce GHG in shipping. “There is no Plan B. We have to reduce emissions,” said Niclas Svenningsen, UNFCCC. So why is it that ship designs employing large-scale sail systems still look futuristic? Innovations in sail technology are actually further ahead than most of the world realizes. 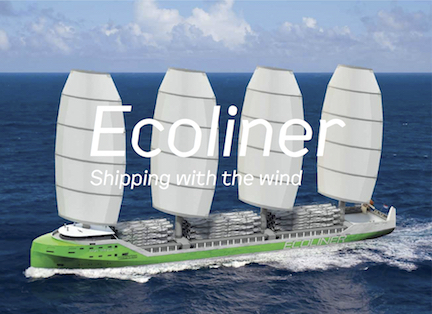 The Ecoliner, a hybrid sailing cargo ship designed by Dutch naval architects Dykstra, as part of the EU-funded SAIL consortium project, offers massive energy efficiency gains under optimum sailing conditions (not using the auxiliary engine). Simultaneously, there is rapid growth in the use of traditional sailing ships, with and without engines, moving high-quality, organic products to growing niche markets. Significant global reductions in GHG emissions will also happen with decreased trade volumes overall. This is inevitable due to realities of climate protection and supply constraints for easily extracted, lower-sulfur petroleum. Consumers need to begin to understand their energy-demands and how much GHG their product-shipments are emitting. At the Paris conference, projects promoting local-based economies and decreased consumption are being praised as the sustainable future. 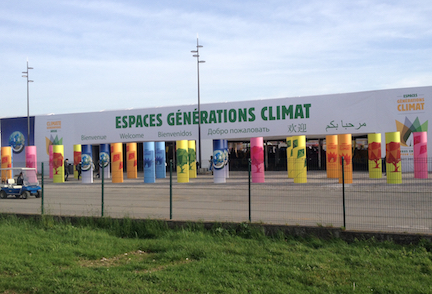 COP21 in Paris is putting in place a regulatory framework to address GHG emissions worldwide. SAIL MED proposed stronger language for the shipping sector to include the use of renewable energy and specifically sail technology in the new Agreement. (The suggested language is available here.) This draft language has been shared with stakeholders and policy makers at COP21, including several island nations as well as Monaco. SAIL MED and Sail Transport Network have directly involved states in considering sail power for their national climate strategies. The suggested shipping-emissions language in the draft climate agreement has also been widely Tweeted. (@sail_med). A clear regulatory signal from Paris for COP21 can help drive technological and transformational change in the shipping industry. Although the Paris agreement will be non-binding on the parties, the massive support and momentum it has generated can make countries feel responsible and act smarter about GHG emissions and shipping. But it is also up to consumers, producers, ship owners, local producers, port states and flag states to demand that shipping cleans up its act and sails forward on a responsible course of clean transport. Ecoliner, developed by the SAIL consortium of 7 North Sea nations. SAIL MED, founded by Sail Transport Network to restore traditional sailing cargo shipping in the Mediterranean Sea and bring about new builds there such the Ecoliner. SAIL MED's Poster on display at the Paris COP21 UN climate meeting. If you would like one, send $25-US to the address below.